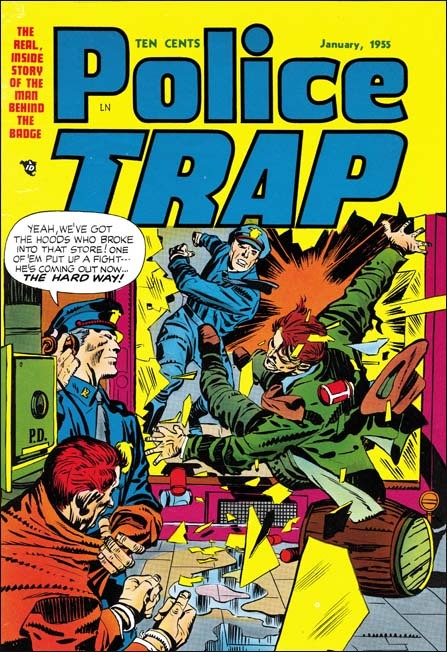 The cover for Police Trap #3 departed from the more serene covers used for the first two issues. Instead PT #3 was a typically well done Kirby slugfest. Such dramatic punches were often found in Simon and Kirby stories but rarely appeared on the crime covers. I can think of only one other case (Headline #45, January 1951) and that one was not nearly as nicely done as this cover. There was another cover considered for issue #3 but in the end never used. The alternative cover featured some motorcycle policeman and while a good cover it was not nearly as dramatic as this one. It is always nice when an artist signs his work. Otherwise it becomes difficult to determine attributions since credits were not usually provided. There was also another signed S&K production piece by William Hargis (Young Love #62, October 1954, “Too Darned Innocent” ). I really need to do some careful comparison with some of the other unattributed pieces from this period as it is likely there exists some unsigned pieces by Hargis as well. Still it appears that Hargis only worked for Joe and Jack during a short period. Most of his work at this time seemed to have been for Quality Comics. 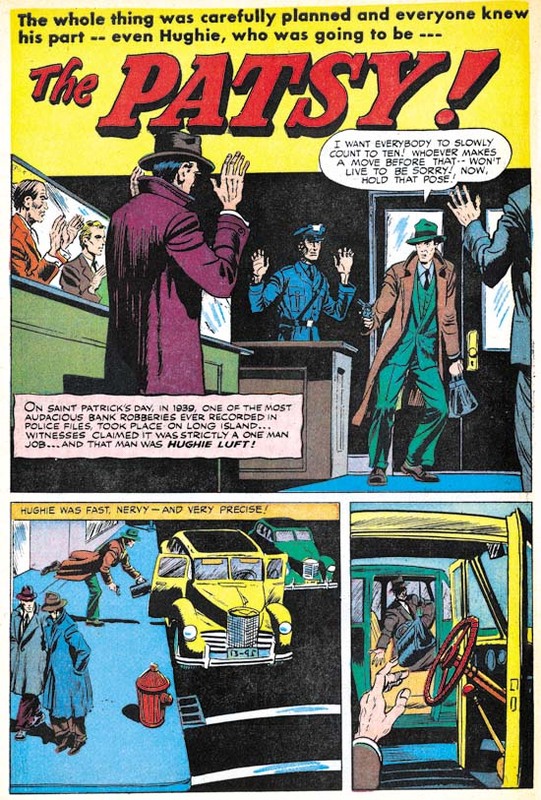 A number of artists appeared for a short time in Simon and Kirby productions from this period. Most were not that impressive but Hargis was an exception. He graphically tells the story well and has a pleasing drawing style. Hargis uses details to provide insight into his characters. 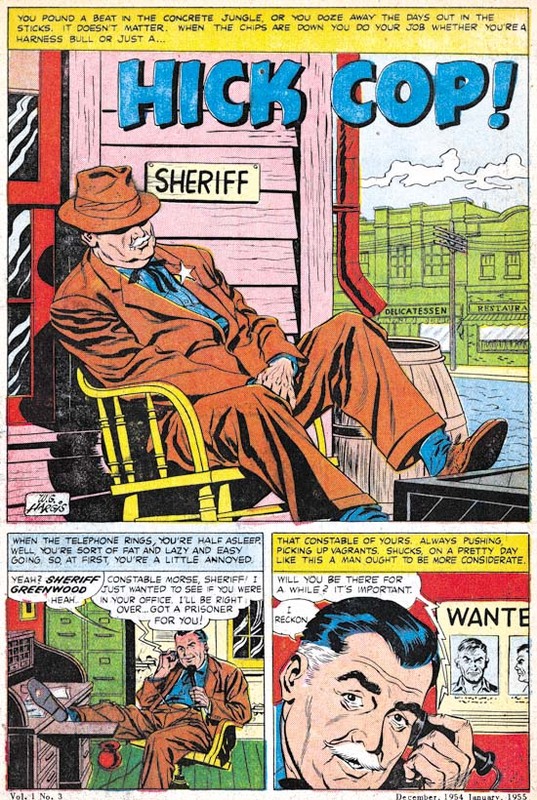 I love the way that the sheriff has a hole in the sole of his shoe in the first story panel. Albistur is one of my favorite S&K artists from this period. “The Mountie” is a typical example of his talent. The mounted policemen have disappeared from most American cities but still have a presence, although diminished, in New York City. I have not seen any in the last few months but I would regularly hear them go down my street. It is not at all clear to me whether horses are an effective police tool but they certainly make for great public relations. Whenever I see them they always attract photographers and animal lovers. AS I have said, there were a number of artists that worked a short time for Joe and Jack during this period. Of course I wish I could identify them all but for academic reasons as frankly many were little more than adequate. 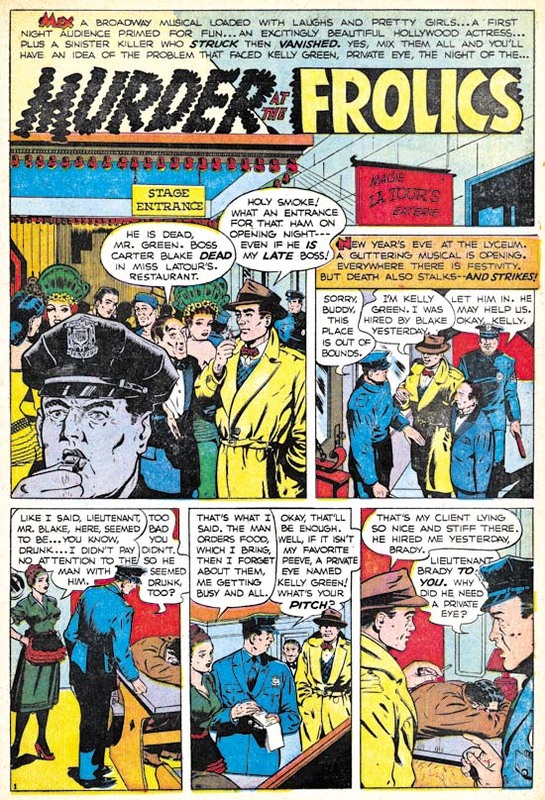 The biggest problem with this particular artist is that his figures tend to be a bit stiff as, for instance, in the last panel of this page. 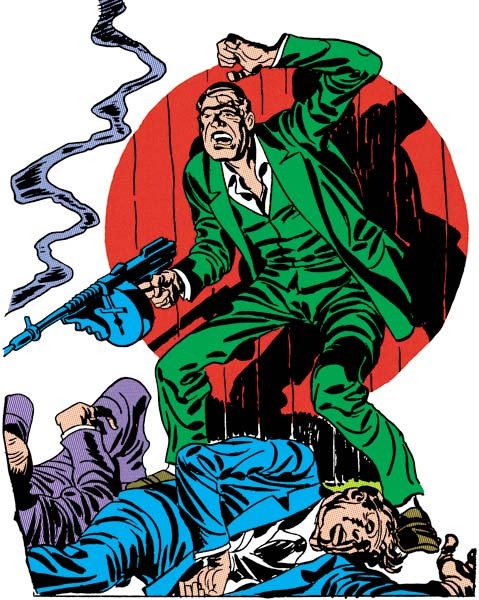 I really like Bill Draut’s art, at least while he worked for Simon and Kirby. But this particular splash page has got to be one of my favorites. Generally Bill did not do full page splashes and in a way this is not one either. What Draut has done was combine two splashes separated by the title caption. 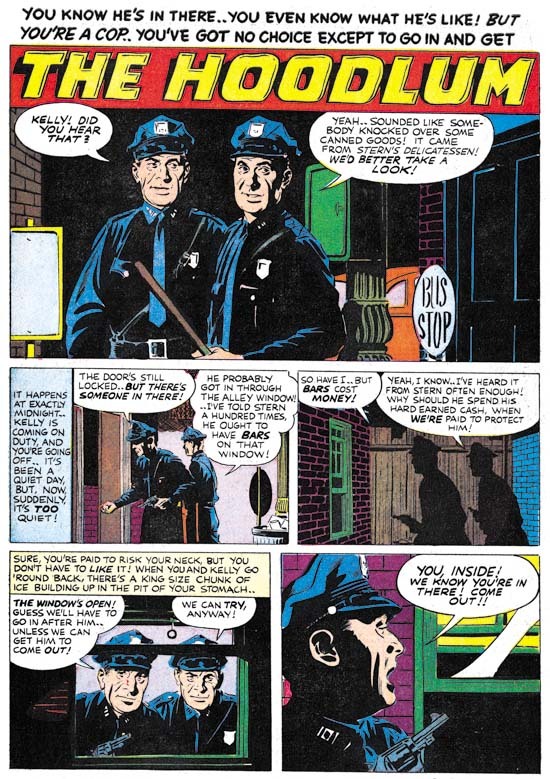 The top shows a deserted neighborhood with only a single policeman in the background. Very simple but lovingly handled with great attention to the tenement buildings. The bottom seems pure chaos but actually is not. 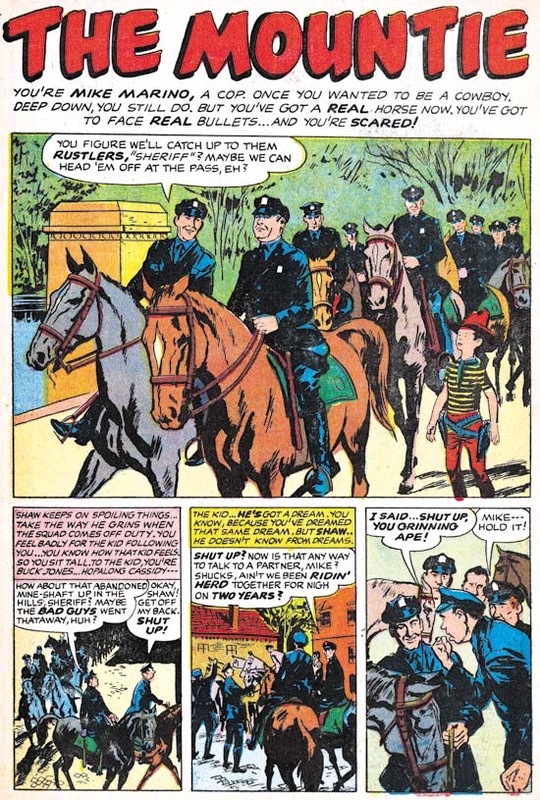 Helped by nice work by the colorist, the lower splash focuses on the confrontation between a cop and some locals seemingly concerning some youth the policeman has apprehended. Bill has provided an interesting and varied crowd. The juxtaposition of the quiet and noisy street scenes makes the page all that more interesting. I have seen the original art for “Tough Beat” and the upper portion of the splash page, the quiet street scene, was inked on tracing paper. 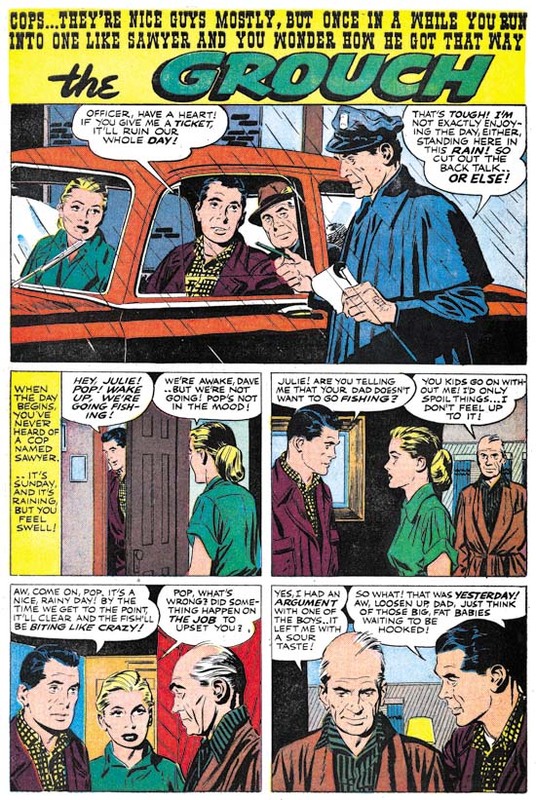 I found this puzzling until I noticed the last panel of the story was the same street scene with different inking. Apparently Draut placed the tracing paper over the final panel and used it as a guide for working on the upper part of the splash page. Faster than manually copying the art onto the actual illustration board while the use of tracing paper would be undetectable in the final printed version. Posted June 12, 2011 in 2011/06, Publications, Topic. 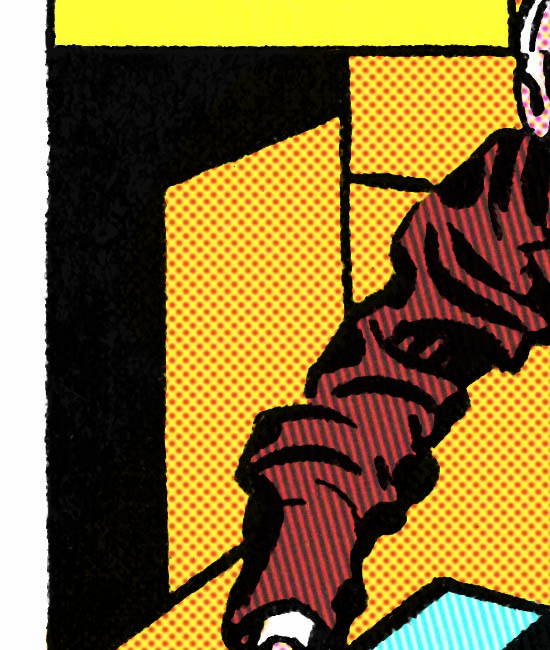 By now it is no secret that the next entree in the Simon and Kirby Library is Crime. 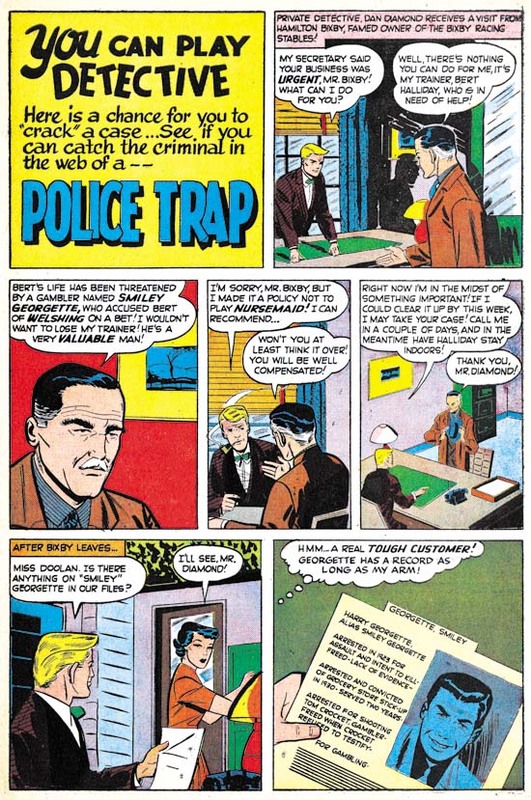 I original assumed that since Titan was releasing “Joe Simon: My Life In Comics” in time for the San Diego show that the Crime book would be come out the following year. I provided Titan with a schedule that showed my restoration work would conclude by the end of August. There must have been some sort of slip up because Titan did not inform me until some months later that they hoped to release S&K Crime in time for the New York Comic Con. With restorations finished in August there was no way the book would be available for the show in October. Fortunately by the time I found out about Titan’s plans my restoration work had been going amazingly well and I was already about a month ahead of schedule. Titan provided a drop dead date that seemed possible but by no means certain. So I buckled under and worked even harder. I was unclear whether Titan’s drop dead date was for the restorations or for putting the entire book together, but in any case I have managed to beat it by a couple of weeks. Now my work is done and it is off to Titan. I am sure I will write about the S&K Crime volume in greater detail as the release date approaches. A decision has not yet been made on what the next book in the S&K Library will be. But in all honesty I would not say even if the decision had been made. I do not like to leak out information before Titan makes their public announcements. 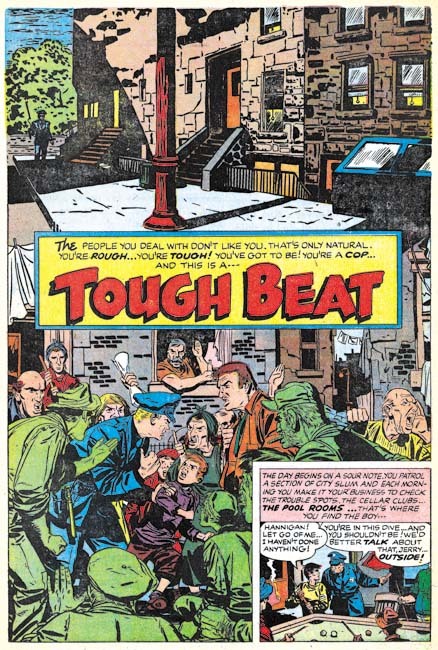 I suggest the reader keep an eye on The Jack Kirby Comics Weblog where Bob keeps track on all the latest Kirby publications and consistently scoops me out. Last week I got a surprise package, some advance copies of “Joe Simon: My Life In Comics”. Advanced? Well those lucky enough to go to Heroes Con had the opportunity to pick up copies of Titan’s newest book. Amazon says they will release the title on June 21. But now I have seen on the Internet that people have already received their copies and my comic book shop had one as well. So I guess advance is not an accurate term for the copies I received. 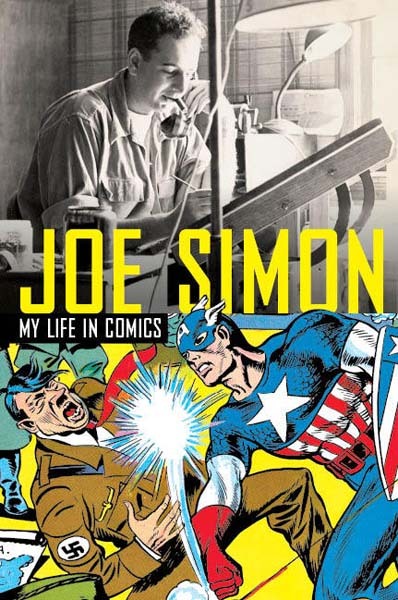 “Joe Simon: My Life In Comics” if finally out. There are always some who will disagree, but I like this book cover. Joe’s name stands out, there is a famous piece of comic book art and my favorite photograph of Joe. There is he is talking on the phone while working on some art and of course smoking his cigar. And what could be timelier than Captain America who will be appearing in movie theaters in the near future? 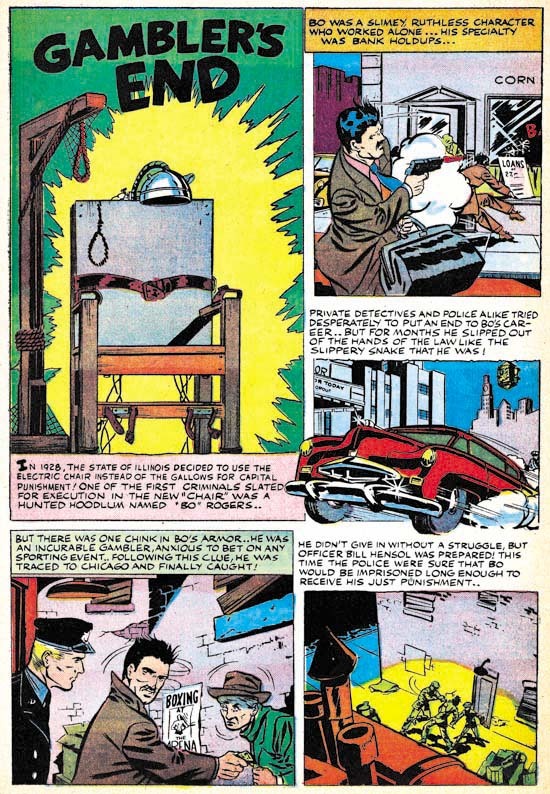 The spine (not shown in the above image) has a figure of Fighting American. Generally speaking, biographies or autobiographies of artists can be divided into two categories, those that are primarily about the art and those mainly about the biography. This book falls into the second group. The book is the more standard sized book and not the large size usually used for art books. There are black and white illustrations distributed throughout the book and a small section of colored plates. These are good aids to the story Joe presents but I doubt that anyone would pick up this book just for the art. One of the advantages of being primarily a biography is that Titan can keep the price way down. The book lists as $24.95 for 256 pages. Amazon is selling it for $14.67. Hey in my neighbor a movie and some popcorn will come to much more than that! Now I have heard on the Internet some remarks from some people about why some would not be buying this book. I have no problem with people being careful about what books they buy. Especially now when we still have not recovered from the Great Recession. But allow me to clarify some facts about this book so that the reader can make an informed decision. 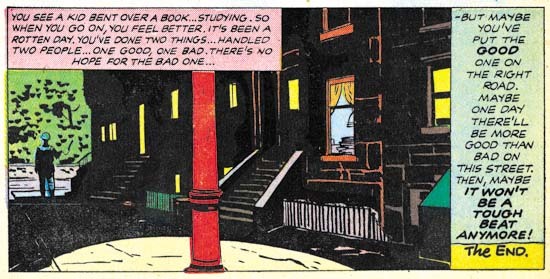 The most common statement I have heard is that some already have “The Comic Book Makers” so there is no reason to pick up “My Life In Comics”. Simply put “My Life In Comics” is not “The Comic Book Makers” warmed over. Joe is a natural story teller and while both books cover the same life, he tells different stories in each book. So if you want to hear all Joe’s stories you have to read both books. Further “My Life In Comics” covers the years that follow “The Comic Book Makers”. Among other things Simon has some interesting things to say about his second legal battle over Captain America. Another explanation I have heard about why some are not planning to purchase Joe’s latest book is that their interests lie in comics not in Joe’s life. However the title is “My Life In Comics” which should suggest that actually comics are the subject of this book. Yes there is some information about Simon’s life outside of comics but it is minimal and often has bearing on his career in comic books. Most of the founders of the comic book industry are now gone. Fortunately some of the important artists had been interviewed over the years but not nearly enough. A book written by a golden age artist is nothing short of a treasure for anyone interested in the history of comics. I am sure people will be discussing and arguing about “My Life In Comics” for years to come. The Comic Journal has recently reviewed Titan’s new trade-back “Fighting American” (Preview: Fighting American). I understand some have already obtained copies of the book but I have yet to see any in the comic book store I use. I do not have a copy but I have had a chance to briefly look at one belonging to Joe Simon. 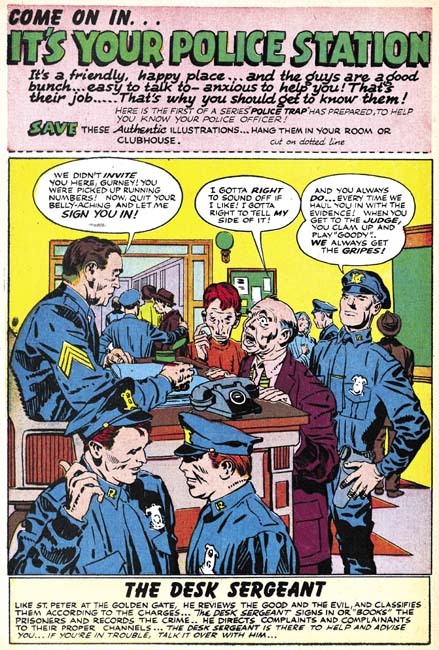 The material included in this trade-back is the same found in the previously released “The Simon and Kirby Superheroes”. So if you already have the Superheroes book you may not feel the need to pick up the “Fighting American” trade-back. But TCJ’s article is not just a review, it is a preview as well. With Titan’s permission they provide the complete story “Home-Coming Year 3000”). So if you do not have either the Superheroes or the new “Fighting American” books you can see what you are missing. There is an interesting comment that someone has made to The Comic Journal article. The commenter claims that the art has been touched up and in particular the some of the line art in the book was thicker than in the original comics. I will discuss his claim later in this post but I thought I would use this as an opportunity to discuss a little bit about the restoration of line art that I do for Titan’s Simon and Kirby books. 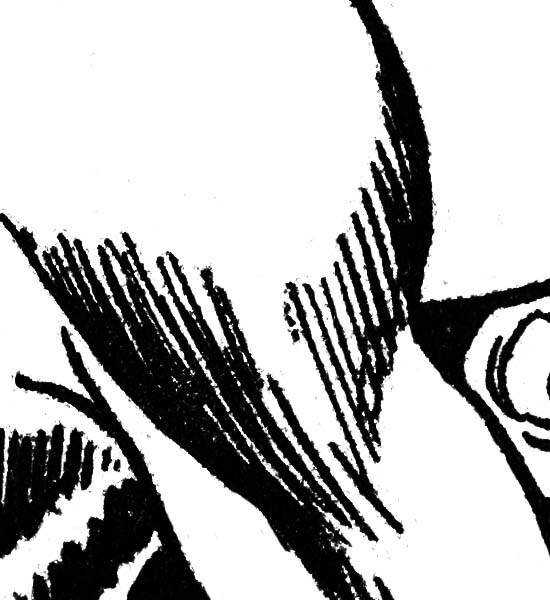 Readers of my previous posts on the subject of restoration should know that I do not recreate line art (a process that Marvel still continues to use for their reprints of golden age material). However the end result of my restorations is by no means just a scan. I have no problems with describing what I do as “touch ups” only not in the manner that the TCJ commenter uses the term. Frankly the original printing used in these comics was pretty poor. Now as far as I am concerned reprints of just scans is far superior to art recreation however I prefer to try to correct some of the printing flaws. 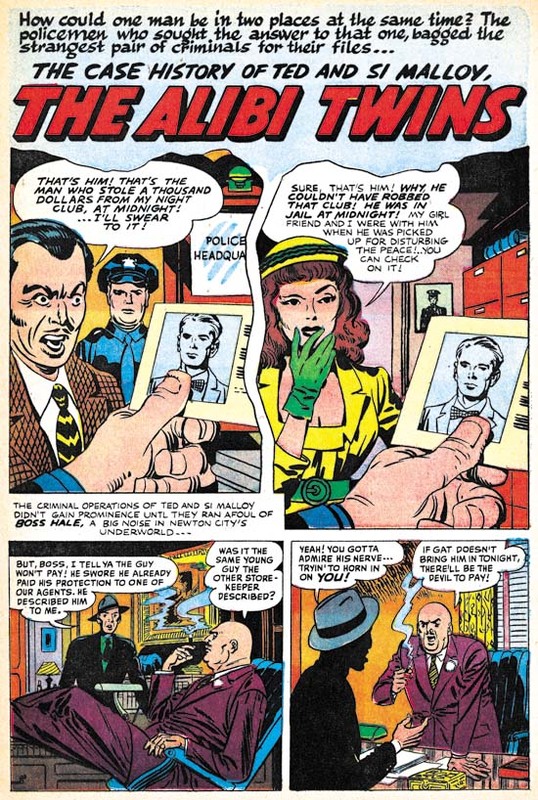 The above image gives an example of the types of printing flaws typically found in gold and silver age comics. Note that the area of solid black is not actually solid or black. Instead there are spots that the ink did not cover at all and even where the black ink is applied it is so thin that the underlying magenta ink can be seen*. Also note how the in the upper right there appears to be two closely spaced horizontal lines. Actually there really was only supposed to be one horizontal line but the printing left ink only on the edges of the original line and failed to reach the center of the line. When selecting an image for this post I debated with myself whether to use the original scan or after it had been processed with Photoshop to enhance the colors. There appears to be no yellow in the area shown but actually almost all of it had yellow. If the reader looks at the very top of the image and compares it to the left edge you should be able to see the very faint yellow remains. With Photoshop I can bring out the colors better which allows for more accurate color restoration. Above shows an image of the same area after restoration. The solid black is now truly solid, the center of the horizontal line are filled and similar flaws throughout are corrected. But I am not recreating the line art just doing touch ups. Some may find the restored version rather glaring. The blacks may now seem a bit too much black. However I am not doing restorations for viewing on a computer monitor. The final product is a printed book and things will look different. The image presented is blown up and in the printed version occupies only a very small area of the page. Further the black will not look quite so black when printed. As mentioned earlier, a TCJ commenter claimed that the art lines had been thickened in the restoration. Unfortunately he did not give an specific examples nor have I been able to find any in the story previewed by the Comics Journal. so I can have provided a close-up from the original scan only this time showing it in black and white. Simon and Kirby did not use very fine lines but I selected an area where the lines are as fine as they get in the story. Above is the same area after restoration. Note that small flakes of black can be seen attached or nearby the line art. These are printing flaws in the original printing. They maybe a little hard to see in the scan of the original comic because they are obscured by the colored inks that come out as black dots in the unprocessed original scan but look at the area without such dots on the right and you can see the flaws there as well. I do not try to remove every printing flaw only the ones the more serious ones. In the above image I have changed the restored version from black to magenta and overlaid it over the original scan. The restoration was so precise that all that magenta of the restored version could not be seen. Had the lines really been thickened in the restoration the blacks would have been ringed with magenta. To bring out how perfectly it is aligned I purposely erased a strip from the original scan so that the magenta version of the restoration could be seen. So why did the TCJ commenter claim the lines were thicker in the restored versions? I suspect it is all a matter of perception. 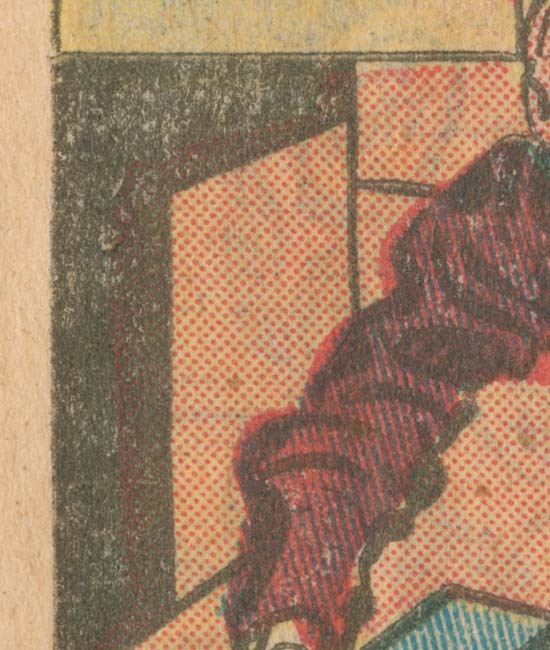 The blacks are blacker in the restoration than in the original comic book printing. Blacker lines could give the impression of thicker lines. But I believe the most important reason for the TCJ commenter’s error was due to his comparison of Internet images with the original printing. My restorations are based on scans done at 600 dots per inch. Generally everything from 400 dpi and above have fine enough resolution that the human eye can not detect that the image is actually composed of small dots. Actually most people have trouble seeing it at 300 dpi but at lower resolutions the deterioration of the image quality is easily detected. Computer monitors have very low resolution. Monitors differ in size and resolution but for example my monitor has approximately 85 dots per inch. 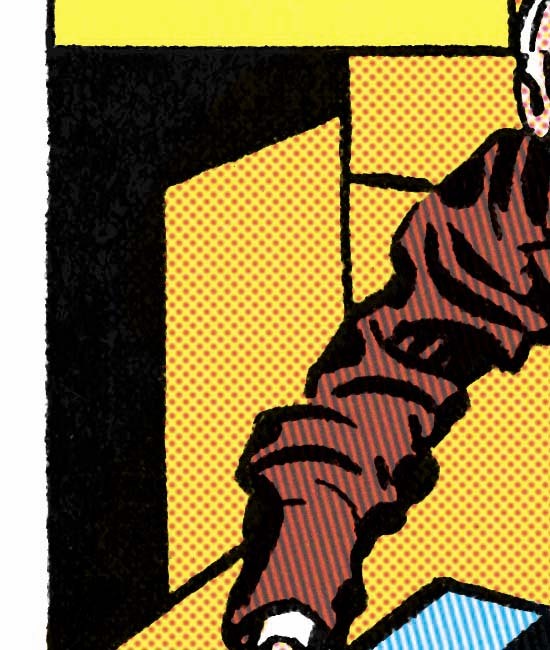 The resolution is so low that the color in “Home-Coming Year 3000” looks solid when in the original comic the dots used for the coloring are clearly visible. You simply cannot make a good judgment on the thickness of lines based on an Internet image of a full page. Which is why I used close-ups to make the comparison. To see how inaccurate the restorations was in the previous Fighting American reprint see my post “Simon and Kirby Superheroes”, A Must Buy. For further observations about my restoratios see my Newsarama interview. * Although the magenta plate has shifted toward the left that is not why there is colored ink under the black. This was done on purpose to help mask such registration problems. Had the magenta plate shifted to the right the nearby area would still be color correctly but without the overlap a white band would have appeared bordering black. The extending of colored inks under areas meant for black is called trapping. Today trapping is usually created by computer software but before that photographic processes were often used. 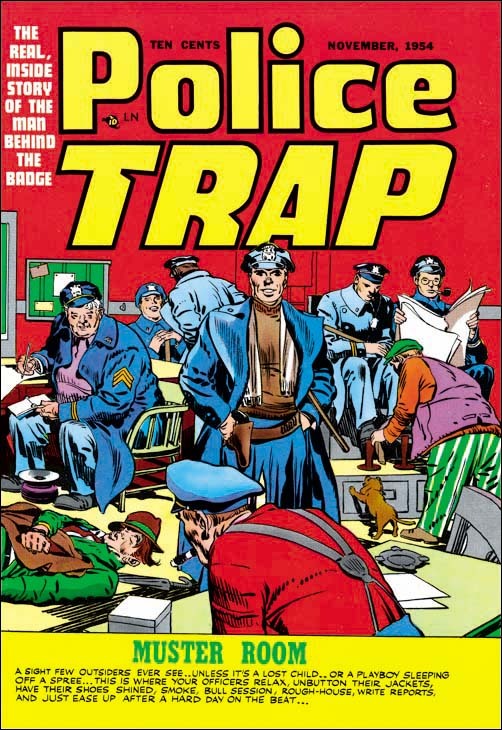 However when trapping was done for comic books it was done by hand.